Last November, the annual conference of the American Society for Theatre Research (ASTR)—themed “Arousal: Theatre, Performance, Embodiment”—was set to explore the “arousing” nature of theatrical history and practice, while also investigating the potential to disrupt the stiffness and decorum of traditional academic conferences. 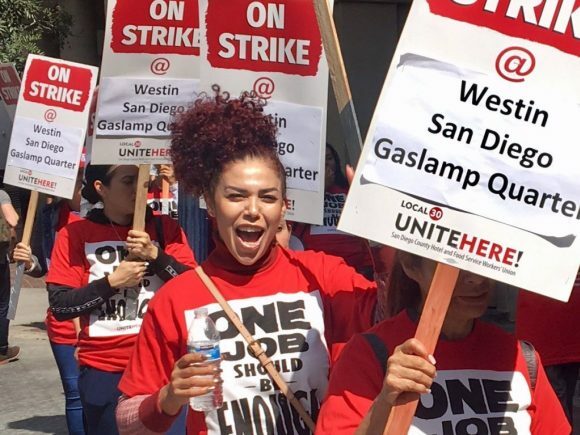 This notion of disruption came full circle when a thirty-five-day strike by the UNITE Here Local 30 union members began at the conference venue—the Westin San Diego Gaslamp Quarter—in early October. As an academic and professional organization that fosters the development and pursuit of scholarship on theatre and performance worldwide, ASTR represents a membership that is a mixture of over seven hundred theatre scholars, college and university professors, and working theatre practitioners. Rather than ask these members—many of whom belong to unions of their own—to cross an active picket line, the executive committee of ASTR was forced to cancel its contract with the hotel five days prior to the start of the event. In an attempt to provide an alternative to members still traveling to California, ASTR then relocated the proceedings to the campus of University of California, San Diego, and reconstituted it as the ASTR Forum (La Jolla). As a new member and first-time ASTR conference attendee, I witnessed the struggle of an organization deciding to make a values-driven decision and trying to honor it—even when the strike was resolved a few days after the decision to cancel was made. To get a sense of perspective on how ASTR grappled with the consequences of making a choice that was unprecedented in the organization’s history, I spoke to the outgoing vice president of conferences, Jill Stevenson. We discussed questions of visible and invisible labor, how an organization translates the values outlined in its mission into defensible real-world positions, the (im)materiality of conferences, and the changing nature of work in the academy as professional artists are more frequently taking up space in the ivory towers. L: Cason Murphy. R: Jill Stevenson. Cason Murphy: This was your final conference as vice president of conferences for ASTR, right? Jill Stevenson: Not exactly the swan song I had in mind, but yes. Cason: I can imagine not! However, you may have been the right person at the right time to be in your position. The idea of redefining and re-evaluating labor seems to be the keystone to your legacy. Jill: I hadn’t really thought about it that way, but you’re right. I came onto the executive committee when I was also chairing the Working Conditions Task Force, and there was growing understanding among the executive committee that professional academic organizations have a changing membership because of the way the academy has changed. In particular, there are fewer tenure-track positions and more contingent labor positions. Rather than the “adjunct” and “full-time” labels, there are the three-year roles, visiting roles, one-year roles, renewables, non-renewables, and working professionals. The traditional membership categories no longer seemed to fit. I was really aware what that difference meant to peoples’ ability to participate fully in academic organizations, and that a lot of the conversations we were having institutionally did not use language that reflected that changing reality for people. Cason: What language is that? Jill: We tried to make the case for using words like “labor” and “work” to discuss what we do, as opposed to “scholarship” and “professional development,” which are words that I feel ignore the real labor involved—like the labor to get to and from work because you’re working at three different institutions in a city. Or the cost of taking time away from family to go to a conference. Cason: It made me—someone who traditionally sees much of conference programming in a two-dimensional way, as it’s laid out on the schedule—really think about the invisible labor that goes into a conference. Both for the attendees and the organizers. Jill: You’re not the only one. I think what became so apparent, and had always been very apparent to me, especially after assuming my role, was the tremendous amount of labor the programming chairs put in to organizing this conference. The amount of time they contribute all of a sudden became more visible to other members of the ASTR leadership, who didn’t quite realize how much goes into building the conference. Cason: In most cases, good conference planning seems to try to minimize disruption and make itself as invisible as possible. Yet, from the program notes, it seems like disruption was baked into this conference from the start. 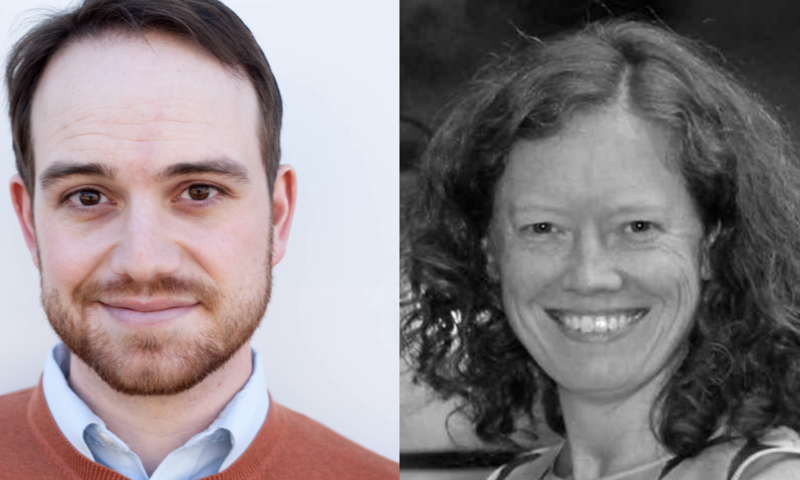 Jill: Our program chairs—Christin Essin, Chase Bringardner, and Kirsten Pullen—really saw in this conference an opportunity to get people out into San Diego and interact with the city. That was present even as early as their general call for proposals. They didn’t want this to seem like a hermitically sealed event in an air-conditioned hotel. They really wanted it to reach and engage the community. The fact that San Diego came in to interact with our conference in a way—through the strike—ultimately brought about the kind of result they were looking for. Cason: I became aware of the strike, by workers in the UNITE HERE hotel and food services union, in mid-October when the Detroit branch accused the Foo Fighters of crossing the picket line at the Westin Book Cadillac in their city. When did ASTR become aware of the strike in San Diego? Jill: The strike started nationally on 8 October—the San Diego Westin was one of eight hotels across the country targeted in this larger strike against Marriott—and we were immediately aware of it. That said, we did not think it was going to go on as long as it did, because most strikes do not. We talked casually about it for ten days, but after that we started formal conversations with the union as well as the hotel. While that seems like that’s a lot of time, it’s really not when you’re having to make these big decisions. Jill: There was really very little discussion at the executive committee level about holding the conference if it required people to cross a picket line. Knowing how many of our members are in unions of their own, we felt very much that the values of the organization—and the decisions we made—had to reflect that. There were definitely, and importantly, members of the executive committee who played devil’s advocate. You have to do that in a serious conversation. But the program chairs did not receive pushback from leadership over their own arousal about this labor issue. Knowing how many of our members are in unions of their own, we felt very much that the values of the organization—and the decisions we made—had to reflect that. Cason: I find it fascinating that you use that particular word, because the theme of this conference was “Arousal: Theatre, Performance, and Embodiment,” which ties right back into that idea of disruption and the resulting emotional reaction. Jill: One of the major ideas that shaped our program chairs’ thinking was their own personal arousal around the issue of labor. Mine too. That made the discussion about cancelling this conference particularly interesting, because I was highly aware that people had put a lot of financial and personal investment into it. The decision to cancel required us to find a way to explain this without seeming to devalue people’s labor. Cason: The leadership team seemed to want to act with transparency and quickness in communicating each update to the membership. Was it difficult to get a clear party line with all of the diverse voices in the room? Jill: If you go to the 2018 conference page, there is a tab where you can read all of our emails that went out members and you can see us trying to find language and trying to value all the different people who were going to be coming. I wouldn’t say we flubbed communication, but we did struggle. And we confused members at moments, because we ourselves were trying to figure out how best to communicate in a very stressful time period. I think anyone who has been on large committees knows it’s really difficult the more people you bring into the conversation. So, while you want to represent as many voices as possible, that makes making a very quick and difficult decision really hard. There is always that balance: you want to include all of these perspectives, but in the end there is only a small group of us that has to make the choice. Cason: To make the espoused values into lived values. Jill: Right. And, actually, there were three sets of issues we were facing. There were the values issues, but there were also logistical issues and financial issues. Those all came into the conversation within a three-week period. We dealt with the values first. That’s our baseline and all our decisions get made from there. But once you make that values-driven decision, then it turns logistic. A worker on strike. Photo by UNITE HERE Local 30. Cason: Did any of your assumptions about leadership get challenged during this process? Jill: Although we felt strongly that we, as elected officials, were charged with making this decision, we were aware that we didn’t know where the membership stood. We were making assumptions about where they stood on some of these issues: about losing money, about whether this was a decision they would support, about how communication could have been different, about whether we should only hold our future conferences at union hotels. And that was an incredibly vulnerable place to be. But all of the people who were in leadership roles for ASTR in 2018 really worked toward being as transparent as possible—opening up the space around the decision-making process and making it feel like it is a responsive one. So that there is dialogue, not just a monologue. Cason: And that’s what leadership is, right? Cason: When you made your decision to not cross the picket line public on 24 October, did that arouse any reactions from the hotel or the union? Because we were quite clear about where our values were, it seemed sometimes that both sides were hoping we would help shift the other toward resolution more quickly. And the longer we took that principled stand, it did feel like the balance was shifting. But our main interest was always to our membership, never to the hotel or the union. Cason: ASTR cancelled its contract with the hotel on 9 November and the union accepted a new contract offered by the hotel on 11 November. That certainly feels like a direct result of that principled stand. Jill: I hope so. I know we weren’t the only group that cancelled contracts, but I do think—and I hope this isn’t just my Pollyannaism—that it makes an impact when organizations like ours stand up and say from the beginning that we will not cross the picket line. It didn’t resolve fast enough to help us, but I think that had an impact on the resolution. The new contract—from what we were told by the union—is a very, very good one. And it is historic in certain ways. Also, this wasn’t the first time this type of situation has come up for me. There was a conference for the Association for Theatre in Higher Education (ATHE) that was held in the early 2000s at a hotel in San Francisco, and there was a labor strike going on. Anna Deavere Smith was the keynote but she chose not deliver her speech in the hotel; it was staged in another venue. That was a big deal. But other performers and scholars, like me, crossed the picket line at points to get to events and sessions at the hotel. I don’t remember there being as much vocal conversation. Cason: Is this just a choice that organizations weren’t willing to make ten or fifteen years ago? Jill: I don’t think it’s that we have more values than people in earlier situations. We talk more about these things, and the conference itself doesn’t feel as hermetically sealed as it did fifteen years ago. And I think it is harder to ignore the circumstances around a conference than perhaps one might have been able to before. Perhaps we were just lucky to have the time and the kind of people at the table or the ability financially to cancel—or the stupidity—and we just made a different decision. Some working groups, right as we announced the strike, immediately found spaces around the city on their own. People were, as theatre people are, very entrepreneurial, very “the show must go on,” and made it work. Cason: Do you have any thoughts on why it is harder to ignore these public displays of labor strikes or protests—particularly for us as theatremakers? Is it their visibility in the media or our own social proximity to them? Jill: I think it is all of that. The discussion about labor, the awareness our organization has about how, as academics, we exist in the world. Conversations at the conference are no longer just about scholarship, they are about how our scholarship interacts with the world, and what it means to be a theatre professor right now. Since I started attending conferences, there definitely has been a difference in the frequency of these kinds of conversations. The volume has increased. And not only the volume, but how we are trying to have the conversations. At all levels. Cason: This was your last year as vice president of conferences. Do you feel that you have established a legacy for future ASTR leadership to continue having this conversation? Jill: We had very lengthy executive committee meetings at this conference, much longer than usual, to talk through the lessons of this. There are some ways in which this is going to have long-term impact on the thinking about conference planning. But those won’t impact 2019 or 2020. We already had our contracts built for the next two years prior to this conference, so we can’t actually put contingencies into those contracts now. However, looking further down the road, the leaders of the San Diego chapter of the union directed us to different sites that give you better language to build into your hotel contracts. We have talked about whether it makes sense to only go to union hotels in the future, to continue to support, because that’s not always the case. There are some cities we wouldn’t be able to go to, given the kind of hotel we need and our organization’s size. What would that mean for determining what cities we go to? Cason: The cancellation of the official conference threw travel plans for a lot of members into a bit of chaos. However, I appreciated that ASTR was committed to ensuring some type of gathering took place for those who still wanted to come, or, if nothing else, were stuck with non-refundable plane tickets. Out of that came the “alt-conference,” as several of my working-session members were calling it. Jill: Right. One of the places suggested to reconvene was the campus of University of California, San Diego. We contacted them and asked if they could provide us space so that groups that were still coming and wanted to meet in person had somewhere to meet. And then we planned to have some kind of reception that just allowed us to celebrate together. That is how we got the ASTR Forum (La Jolla). A bit more of a mouthful, but we felt the need to create something official for those members who still had a chance to get their travel reimbursed by their home institutions. The "reception" outside of UCSD. Photo by Iris Tuan. Cason: Do you think it was successful? Jill: Well, simply put, the forum was not a conference. 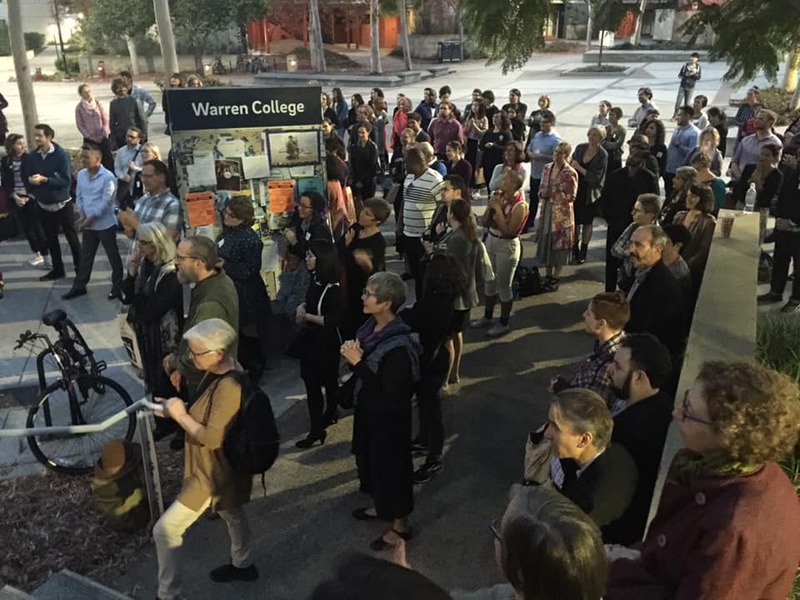 However, a lot of people said they felt it was one of the best working-session situations because nobody was distracted by other things, they really were there just to do the work of sharing their scholarship and making connections with new scholars. These little experiments can sometimes cause one to question just about everything. Are big conferences useful? Is getting together at a hotel and reading a paper with a PowerPoint presentation still the best way to do the kind of work at a conference that we need to do, or are there other ways to do it? Some working groups, right as we announced the strike, immediately found spaces around the city on their own. People were, as theatre people are, very entrepreneurial, very “the show must go on,” and made it work. Cason: Is there a way to quantify the labor that went into the Forum against the labor that went into the conference itself? Jill: I felt very conflicted about the Forum, because I felt very invested in the work of the program, obviously. It was a year of thinking work and then a whole year of labor. And to see all of that not happen… We all create ephemeral things in the theatre, but at least it’s staged once. And when it doesn’t even get that, it is very heartbreaking. But for those who were able to make use of, and find something valuable in, this small thing we were able to provide, I think the Forum did its work. Cason: Everything that happened made me see the spaces I occupied in San Diego differently. I didn’t stay at the Westin, but stayed close by. As a result, I had a chance to explore parts of downtown San Diego with my family, and then go share scholarship at the Forum in a part of university I had never seen before. My working session was in a room with two gigantic pictures of Justice Earl Warren on the walls—which became something that framed several discussions about his work. It’s certainly a conference experience I won’t forget.